During the past 12 months he has been recording a new album with the Sensational Space Shifters line up – the new album Carry Fire will be released on October 13, 2017. Recent cameo appearances with Nigel Kennedy, Deborah Bonham and Paul Rodgers with Brian Johnson have been vivid examples of his ongoing quench for musical thirst. Firstly the top ten I compiled for the Classic Rock website – an impossible task of course to get it down to just ten – apologies in advance if your fave is missing! This is Plant’s nod to the peace and love generation he was a part of in the 60s. For extra authenticity, it includes samples direct from the Woodstock stage of the legendary hippie peace activist Wavy Gravy (‘’we must be in heaven!’’). An uplifting throwback to his hippie flower kid days. Early on in his post Zep career, Plant was more than keen to step outside his comfort zone. This very 80s sounding synth led piece is one such example. Plant cleverly works around the hypnotic quality of the song with a vocal performance of deft agility. It also made for a great opening live number on his early solo tours. Opens with some minor key strumming before this exhilarating rocker really kicks in. Plant stamps his authority with a relentless vocal attack. At the fade Nigel Kennedy enters proceedings to add a quite manic violin solo and is that a cry of ‘’Oh Jimmy!’’ from Plant right at the close? For the mainly covers led Dreamland album, Plant took on several of the songs he had as he put it, been keeping in his back pocket. This stunning arrangement of the Tim Buckley classic, tests Plant’s’ vocal control to the max. To his absolute credit, he never wavers once. Robbie Blunt’s precise guitar work, a lilting drum machine rhythm and an assured Plant vocal were the ingredients that took Big Log into the UK top 20 in 1993 and on to Top of The Pops. Its mellow radio friendly qualities have made it an evergreen staple of the airways ever since. This compelling spiritual croon from the 2010 Band of Joy album unfolds in a sparse traditional setting. Plant builds the tension verse by verse while behind him a plaintive banjo offers a jaunty counterpoint to the dark theme of the lyrics. The final lines are delivered with daunting menace. This track marks one of the few occasions in the early 80s that Plant stared right in the face of his Zeppelin past. Built on an exotic loping churning riff, Plant’s full on vocal attack measures up to the Olympian grandeur of his former band. The late great Cozy Powell adds the percussive kick that drives it along. A truly epic work from his last album Lullaby…and the Ceaselss Roar. There’s an African undercurrent throughout the arrangement and even a touch of Celtic tradition with Welsh Julie Murphy reciting a 14th century poem. Proof that musically, Plant still has new places to go. The Fate Of Nations album saw Plant drawing on a variety of influences and inspirations. Folk rock of the highest order is the agenda here. Enter Fairport legend Richard Thompson who contributes some achingly beautiful guitar lines while Marie Brennan from Clannad supplements Plant’s deft turn of phrase. An outstanding performance. 1988’s Now And Zen album was something of a watershed for Plant. It was the point he was able to successfully reconcile his past with the present. This dynamic ballad is a masterclass of vocal restrain. Guitarist Doug Boyle’s sublime intro paves the way for Plant to vocally twist and turn the song at will. Masterful. For him… it’s still about the next gig, the next musical high, the next vocal performance sung into that Shure microphone. 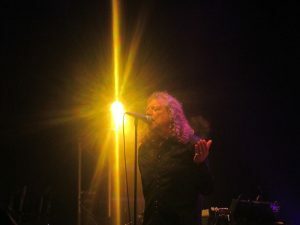 Robert Plant is a musician who has made his vision real…and he continues to keep it real. Dave Lewis – August 16, 2017. In conjunction with the Led Zep news site, each week I will be re- producing highlights from their weekly email update news summary. This goes out every Sunday. Sign up details are below. Many thanks to James Cook. Hello! 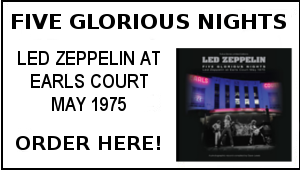 Welcome to the 101st Led Zeppelin News email. We email out a summary of the week’s news every weekend so that you don’t miss anything. We’ve updated our article on “Deus Ex Machina,” the newly released soundboard bootleg album of Led Zeppelin’s March 21, 1975 show in Seattle, with new photographs of the packaging. The bootleg was released in three different versions. Lawyers working for Jimmy Page contacted British newspapers on August 10 to say that Page has reached a “confidential” settlement with his neighbour Robbie Williams. The settlement came after Williams accused Page of being mentally ill in comments that were made public in a Facebook Live broadcast by an Italian radio station. You can read our 3,000-word history of the feud between Page and Williams, which has been updated with the latest news, here. We did some digging on the website of the record label that Robert Plant is signed to and found another hint that his new album is called “Carry Fire.” A page for an album with that name exists on Nonesuch Records’ website, but it’s not available for the public to view. Justin Adams, a guitarist in Robert Plant’s solo band The Sensational Space Shifters, posted a comment on Facebook this week in which he said “I’m back with Robert Plant soon.” The comment was deleted shortly after we reported on it. 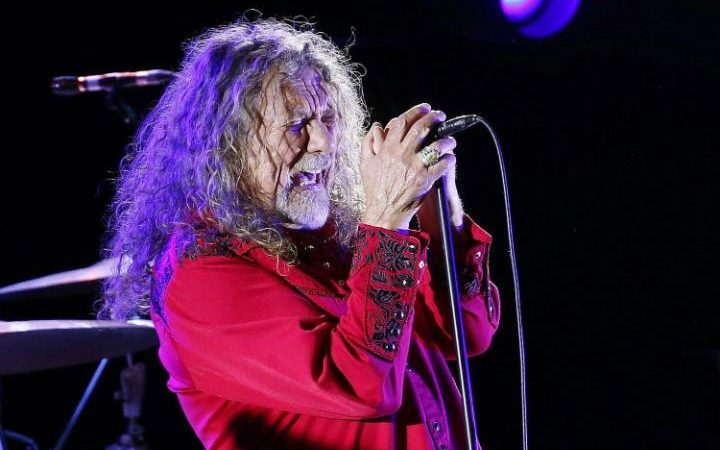 Robert Plant has written a dedication for a new book about blues musicians. The book, “Live from the Mississippi Delta” by Panny Flautt Mayfield, focuses on performances in the Mississippi Delta. You can read Plant’s dedication on the book’s Amazon listing. 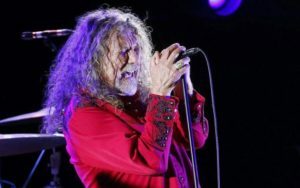 Robert Plant was seen at the Wolverhampton Wanderers football match on August 5. September 22 – The new Black Country Communion album, which will feature Jason Bonham, is due to be released. 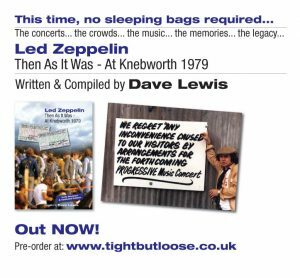 Early Autumn – The next issue of Led Zeppelin magazine Tight But Loose, issue #43, is scheduled to be released. 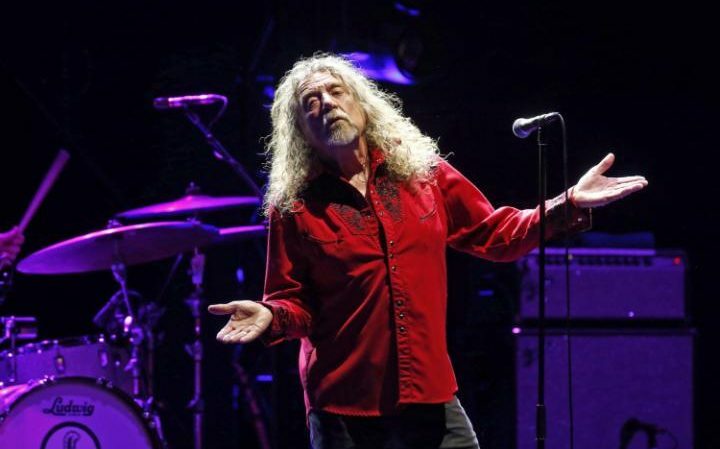 October – Andrew O’Hagan claimed that Robert Plant’s new album will be released this month. 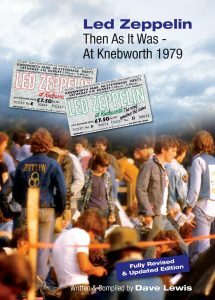 To mark the 38th anniversary of the Knebworth performances here are further extracts from the Led Zeppelin Then As It Was -At Knebworth 1979 book and an interview conducted with myself when the book was originally published in 2009. ‘’The concert had finished and everyone was piling out of the fenced off arena. Spirits were high, and we were in a hurry to find our tent and crash. It was pitch black and the cigarette ends lit up the queue going to the camp site which stretched ahead curving in a right angle after 100 yards or so round to the left. Why wait in line? Sparky decided we’d cut across the right angle and join the queue further down. I dithered as usual thinking through the fog of booze and joints there must be a reason for the dog-leg in the queue. He grabbed my hand and started to run. We got up quite a speed until the earth gave way beneath our feet. ‘’God they were fantastic. Not only the best band I had ever seen (and will ever see) but so much better than any other band. At the end I slept in a ditch, I couldn’t talk as my throat was gone with the cheering, and I was tired. By September I had all of the albums and life was never the same again. In that one day my music taste formed around one band, and although I love other music, lots of other music, nobody else compares. Thirty years on Knebworth in 1979 seems like both yesterday and in another life. …These people are talking about a shared experience that occurred thirty years ago on the first two Saturdays in August 1979. Thousands of rock fans descended on Knebworth Park just outside Stevenage to witness what would ultimately be the last UK performances by Led Zeppelin. Thirty years on the memories are still vivid. Then As It Was – Led Zeppelin At Knebworth 30 Years Gone is a new book compiled by Dave Lewis that chronicles this milestone event in rock history. Q: So what’s the idea behind the book? DL: I was looking to mark the 30th anniversary of the Knebworth shows in some way during 2009 and I had already gathered a fairly large amount of material. The initial idea was for a feature in my Tight But Loose Zep magazine, but it quickly became evident that there was scope to do something more substantial. It then grew from there. To do this milestone anniversary real justice a book format seemed more appropriate, so that led me to come up with a plan to produce a hardback limited edition book. I knew I had various angles from which to unfold the story, and once I got going the text began to expand quite rapidly resulting in a total word count of over 83,000. The basic aim is to pay homage to this key episode in the bands history and provide a unique chronicle that recreates the atmosphere of that summer of thirty years ago – a period that is still held in high affection by Led Zeppelin fans all over the world. Q: Isn’t a book about just two gigs a little restricting? DL: Not when it concerns Led Zeppelin. 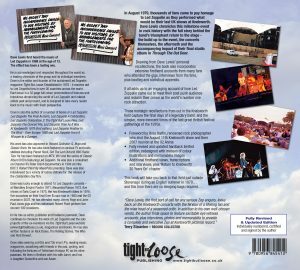 The book encompasses the last eighteen months of the bands existence so alongside the actual gigs, there’s all the build up and aftermath. In documenting that you get the feel of not only the whole state of the band at the time, but the musical landscape in the UK. This was a period of big upheaval. Punk rock had arrived and out of it grew the new wave .This movement was set to render dinosaur bands such as Zeppelin redundant. So what you have is the situation of Zeppelin attempting to re-connect with their audience again, in the face of much derision from the press and media. How they coped with that is an interesting story in itself. It’s worth noting that in 1979 there was still some confusion of where a band like Zep stood in the scheme of things. The music press found that hard to deal with. You only have to look at one of news pages from the time to see that. For example the announcement of Zep’s comeback in the NME ran alongside stories about Rod Stewart, The Damned, Peter Tosh and punk poet John Cooper Clarke. A diversity of old wave and new. After 1980 there’s no doubt the emerging new wave acts were dominating the column inches. In that early eighties era the dinosaurs perhaps were extinct, but by then Zeppelin were no more. Q: The UK press was very wary of them by then – how much of a pressure was that do you think? The fact is, Zeppelin was still a very powerful musical force and I think journalists seemed to have a job admitting that without losing face. In his foreword in the book, Ross Halfin makes a good point that the press didn’t really dislike Zep that much – not in the same way they derided say ELP or Yes. Q: It could be said they hardly endeared themselves to the press by coming back on such a large scale as Knebworth. DL: That’s a fair point. I think Peter Grant was of the opinion that it had to be the biggest comeback possible. When I interviewed him in the early 90s, he told me he felt at the time if they were going to prove they were still the biggest band in the world they needed the biggest platform. By doing that it did make them quite remote from their audience. 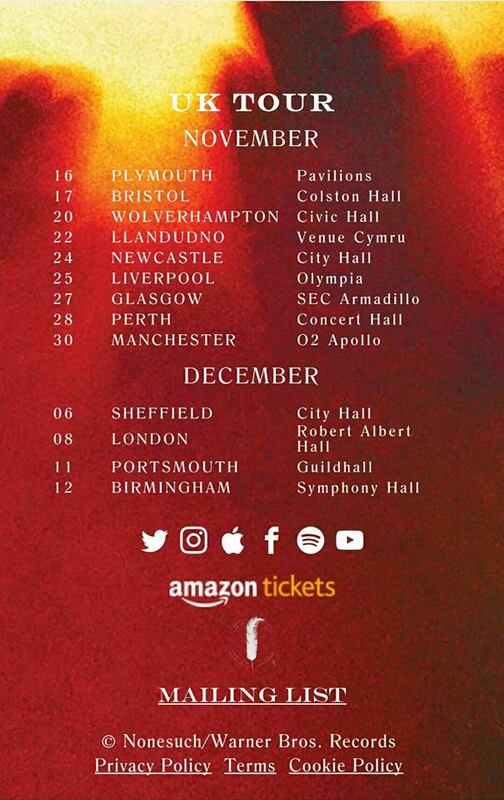 My own opinion is that they could have combined the Knebworth shows with say a week of gigs at London’s Rainbow Theatre. That would have been in keeping with their peers such as The Who. They combined a Wembley Stadium show with dates at The Rainbow and Hammersmith Odeon that year. The Who also seemed more in touch with the musical climate of the time as their Wembley gig had support acts such as The Stranglers and AC/DC, a far more interesting bill than the Knebworth line up that bizarrely included Chas and Dave. Q: What’s the general consensus of opinion about the band’s performances at Knebworth? DL: There have certainly been mixed opinions over the years. 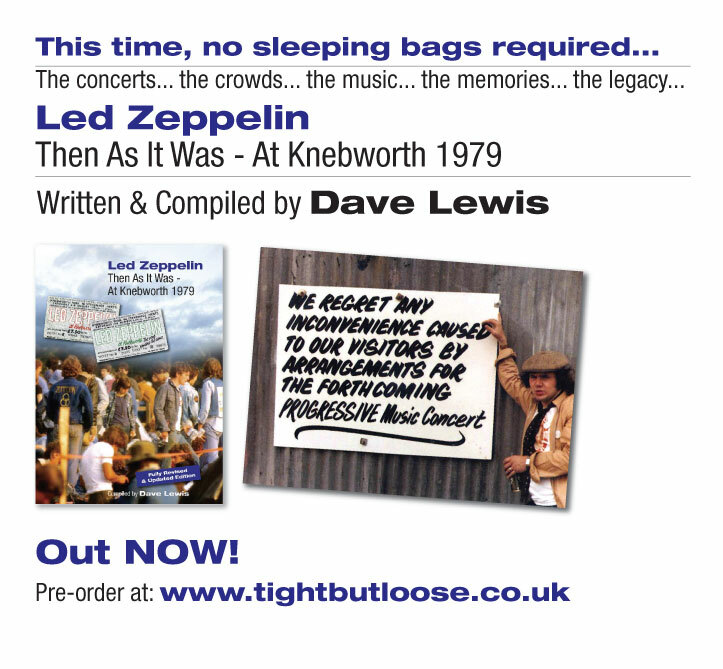 What I do think has happened, is that time has been pretty kind to how Zep at Knebworth is viewed. In the early 90s the poor quality video footage from the second week that surfaced did I think lead to a negative view of the Knebworth event. That situation probably wasn’t helped by Plant himself, who often made public his disdain for their performances at Knebworth. The turning point came when Page unearthed the full multi track camera footage from the Knebworth shows when compiling the official Zep DVD. Yes they may have been rusty, but I think all three of them were surprised by the power that was so evident still. Subsequently the segment Page edited together for the official DVD in 2003 was clear evidence that when it was good, Zep’s performance at Knebworth was very good indeed. The event itself was pure Zeppelin theatre with the screen, lasers and lighting. The DVD segment highlights all that, plus of course the mass adulation from the crowd. It’s generally agreed that the first performance was superior to the second week. In his chapter in the book Larry Bergmann makes the point that the press reaction to the first show may have put them on the back foot leading into that second show. Overall though, Knebworth was a triumph and it put Zep right back in the spotlight. Q: The centrepiece of the book is the first hand recollections from fans that were there – how did you go about collating this feedback? DL: Zep at Knebworth was almost as much about the fans as it was the performances. My objective was to mirror that fact, and to that end I put out a request on the TBL web site for fans to send in their recollections and experiences from being out in the field. The response was excellent, and these first hand accounts form the core of the book. From these recollections, you can detect the air of wonder that this event created. For many young rock fans it was there first gig and the first (and in most cases last) opportunity to see Zeppelin perform live. The prospect of how the band would fare in the post punk musical climate of the day proved irresistible. The fans faced long coach journeys, primitive camping facilities, poor sanitary conditions and long queues for food and drink. Not to mention a very mediocre support bill. Reading through them, it’s evident the esteem Zep were held in at the time. There’s over thirty such reminisces – all very vivid, some humorous, some quite moving. It tells the story of much simpler days. Zep at Knebworth was not the corporate affair that today’s big festival gatherings have become. There was innocence about it all. Q: Can you provide an insight into some of these recollections? DL: Well without giving too much away, there’s a view of the band’s second warm up show in Copenhagen as told by a then 15 year old fan….an hilarious and superbly written account of one young lady fans quest to see if Jimmy was at home at his Boleskine Highland address the week before Knebworth. 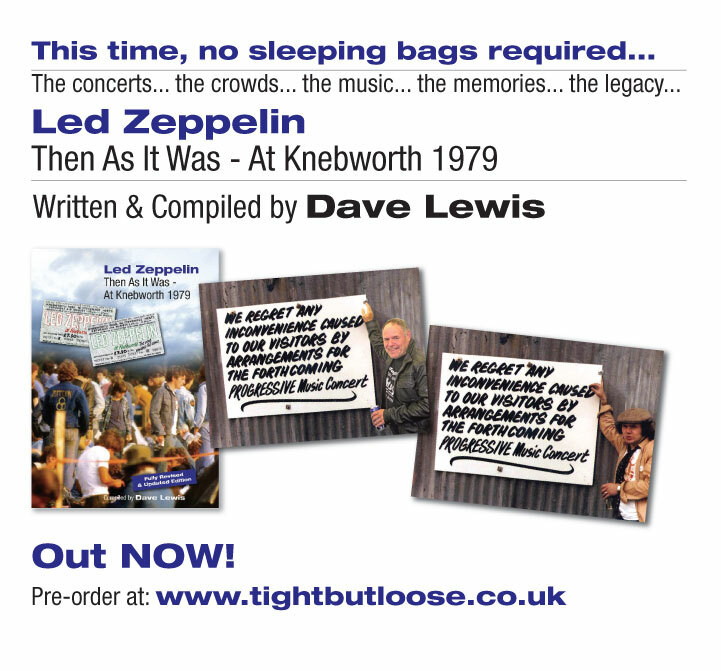 As for the two Knebworth shows, tales include stories such as how one guy averted a potential flooding of the site by fixing two large hoses together that were causing water to slide into the crowd. There’s the innocent fan who was baffled by the repeated cries of ‘Wally’’ at the campsite thinking it might be some new drug or obscure Zep song title (It’s actually an old English rock festival tradition).The enterprising fans from the North East who hired their own coach to get to and from the show, a moving account of the two Canadian fans who won a radio contest to fly over and ended up getting a name check from Robert Plant on stage with their request for Zep to play Trampled Underfoot (‘’This is a little up tempo ditty we’ve been asked to do by some people in Vancouver’’). Then there’s the rather unfortunate story of a young lady who took a short cut coming out of the show and ended up quite literally in the s***. All this for the love of Led Zeppelin! Q: What can you reveal about the photo content of the book? DL: Again what I’ve tried to do is offer a fans angle of the event so there is a good sprinkling of shots taken by fans at the time. These really capture the atmosphere of it all. They encapsulate everything from the setting up of the stage, through the August 2nd soundcheck, to shots of the crowd assembling. There’s lots of denim and hair prevalent of course. Despite the punk explosion, looking at the crowd photos you realise that in 1979 it was rock music that still very much held sway. As for photos of Zep on stage, again I’ve tapped into fans archives. There’s also extensive use of the Knebworth photo collection of Alan Perry who took some very good shots from both weeks. Q: The book contains your original review from the Tight But Loose magazine, how do you look back on that? DL: There’s no denying it’s a rose tinted view but maybe that’s not too surprising. Back then I was 22 year old and my whole world revolved around Zeppelin. I lived and breathed it, so Knebworth was a very big deal. 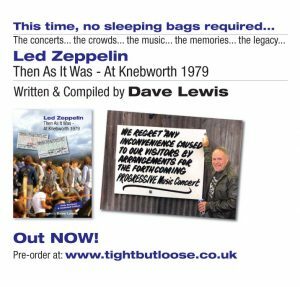 My Zep magazine Tight But Loose was in its infancy and obviously I wanted to offer extensive coverage in the next issue. The review of the August 4th show was a virtual transcript of the tape I had, complete with Plant’s in between patter. I’m not the only one I’m sure who can still reel off verbatim whole chunks of what he said on stage. I arrived early on the morning of August 2nd with the prospect of a 60 hour wait before they came on stage. It’s a shame however that I missed out on spreading the TBL word. In the desperate rush to get near the stage as the gates went down at 4am during the first gig, I dropped the leaflets I had printed up to hand out in the crowd. Not a great marketing move! Q: Knebworth has always been something of a controversial episode in Zep’s history. Not least because of the disagreements between promoter Freddy Bannister and Peter Grant. Does the book chronicle that? DL: I do touch on the controversy of the attendance figures. Clearly there was a problem with Peter Grant and Freddie Bannister which has been addressed in other books–notably Freddy’s own autobiography. I also document the whole build up to the event and the aftermath to offer a clear focus on the state of play within the band at the time. As I state in the introduction, it was a very different Led Zeppelin that approached the Knebworth shows to the one that walked off stage after the triumphant Earls Court shows four years earlier. The setbacks and tragedies had taken their toll. In undertaking a comeback of Knebworth size proportions they had a lot to lose. That air of expectancy was very tangible leading up to the first show. Q: Who else has contributed to the book? DL: As I mentioned, the renowned rock photographer Ross Halfin has written a foreword which documents his experiences in shooting the second show. Chris Charlesworth, one time Melody Maker writer and one of the few journalists accepted into the Zep camp, has contributed a very perceptive opening preface overview. There’s also an engrossing interesting retro view of the whole Knebworth episode from the perspective of an American fan Larry Bergmann. Zep was still a massive deal over there in the late 1970s – there was no punk rock explosion to harm them and In Through The Out Door was a massive seller and number one for weeks. It was sighted as being something of a saviour to the flagging US music industry at the time. So it’s good to gain a view of how it all appeared from across the water. Q: What’s your take on the In Through The Out Door album – isn’t it generally viewed as one of their weaker albums? DL: It probably is viewed that way. Overall I think it still had enough high points to make it a successful record. It certainly carries a high level of John Paul Jones led invention, which for a band in their eleventh year was pretty admirable. This is evident on the likes of Fool In The Rain and Carouselambra. Tracks such as In the Evening, All My Love and I’m Gonna Crawl have also all stood the test of time well. As Nick Kent at the NME commented in his review of the time, the good qualities were worthy of investigation. He stated ‘’There are potential points of departure on this album that deserve following through. The doctor orders a period of intense activity.’’ It’s just a shame they never got an opportunity to heed such advice. Q: There are some interesting Knebworth period interviews given by Robert Plant and John Paul Jones transcribed in the book. Wasn’t one of these going to be a promo interview album? DL: That’s right – it was an interview conducted by J. J.Jackson, a long time supporter of the band. He interviewed Robert and Jonesy after the second Knebworth show and there was a plan to put this interview out as a promo interview album to promote In Through The Out Door in the US. A sleeve was mocked up and a title set ‘’Robert Plant and John Paul Jones Talk About Led Zeppelin Past Present And Future’’ . For reasons unknown it was cancelled. 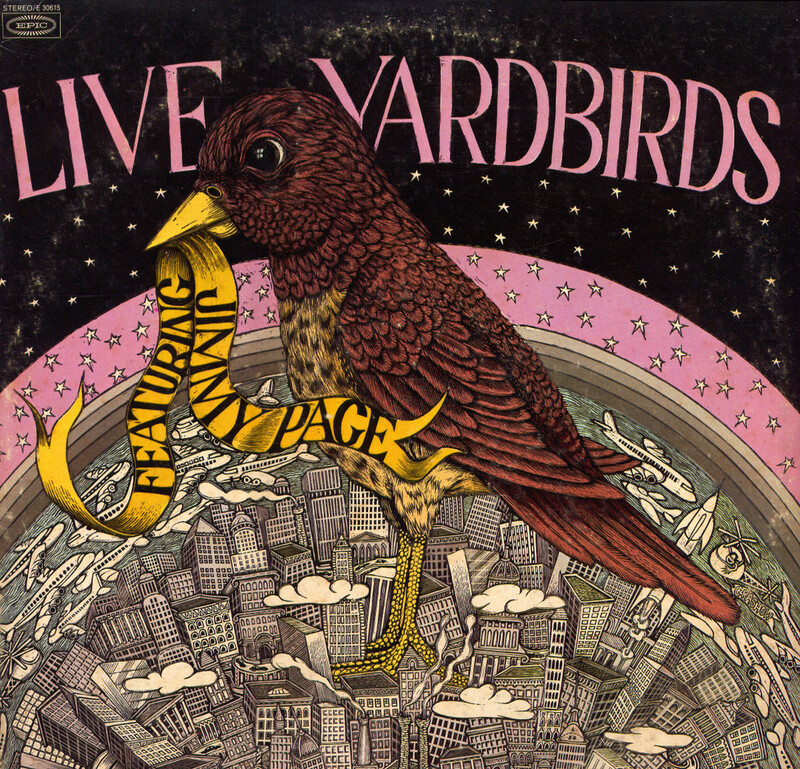 A handful of covers are known to exist and at lest one promo pressing. 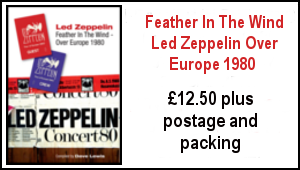 The book provides the opportunity to hear the contents of what is regarded as one of the rarest Zep albums. Q: Wasn’t there a similar situation with a planned Knebworth commemorative single? DL: Again that’s correct. In the UK, Jimmy had the idea of issuing two tracks Wearing And Tearing coupled with Darlene both of which were left off In Through The Out Door. This would have been pressed as single to be made available exclusively at the Knebworth shows. Time ran out on that idea and the tracks eventually surfaced on the Coda album in 1982. Ironically Wearing And Tearing was a high energy speed rocker that might have given the punks a run for their money at the time. Q: What does the appendix sections in the book offer? DL: This area will certainly interest keen Zep collectors. Graeme Hutchinson has drawn up an extensive list of the bootleg LPs, CD’s and DVD’s that have emerged from the shows. 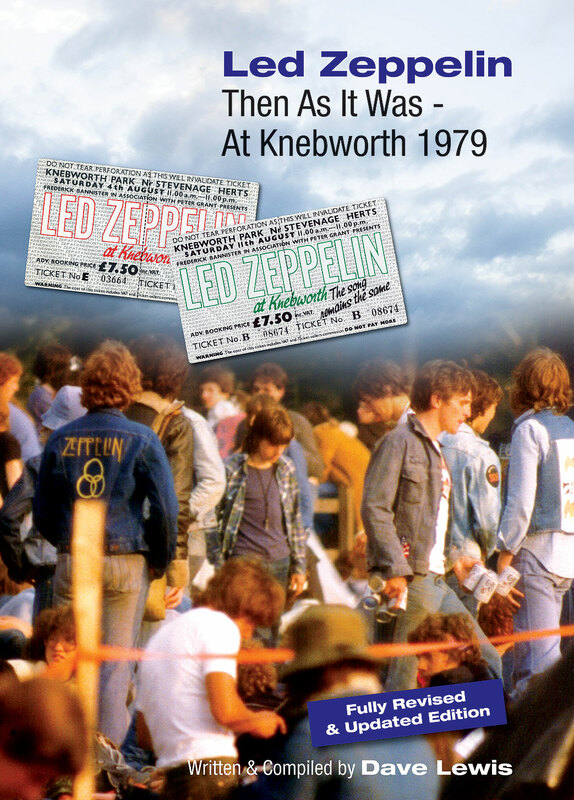 Bootlegs have always played a part in any era of the Zep story and Knebworth is no exception. The lengthy nature of the set list lent itself conveniently to be packaged on multi CD sets and subsequently the two Knebworth shows have been extensively bootlegged. In fact Graeme logs over eighty different vinyl, CD and DVD unofficial releases. 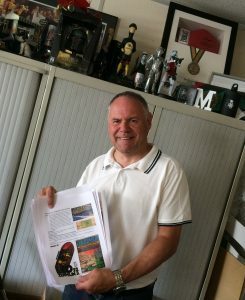 On the same lines, UK collector Nick Anderson also offers a comprehensive and fully illustrated worldwide In Through The Out Door discography. This includes details of the differing promo pressings that came out and the singles that were issued from the album. There’s also am appendix on memorabilia from the Knebworth event honing in on the Brian Knapp Collection, which includes the shirt Jimmy wore at both shows and the violin bow he used with laser effects during his guitar solo showpiece. Q: Where do you think the book’s appeal lies? DL: Well it will certainly appeal to anyone who attended either of the Knebworth shows – on a nostalgic level it’s an affectionate reminder of the way thing were in that field all of thirty years ago. 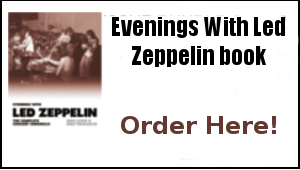 For Zep fans that have come on board since, or were elsewhere at the time it provides the opportunity to find out what it was all about. The many aspects that the book covers: from the build up through to the gigs themselves, the aftermath, the interviews of the time, and of course the fan recollections – all adds up to what I hope is an engaging read that chronicles the final days of Led Zeppelin and the simpler times of the last great festival gatherings of the 1970s. One thing’s for certain – this time there’s no sleeping bags required. 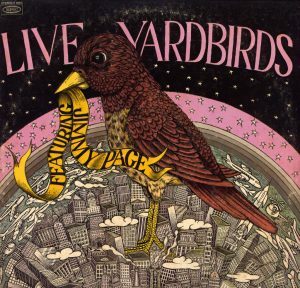 After almost Fifty Years, The Yardbirds-Authorized “Live at the Anderson Theatre “ is finally being officially released, having been totally re-mixed by Jimmy Page. Jimmy has chosen November 5,2017 (Guy Fawkes Day) to present this highly acclaimed, influential album to the world. At this time the infamous line-up was; Keith Relf (Lead Vocals/Harmonica); Jimmy Page (Guitars); Chris Dreja (Bass Guitar); Jim McCarty (Drums/percussion/vocals). 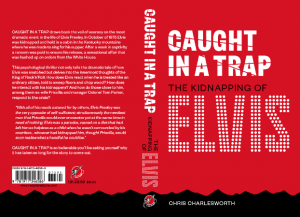 Caught In A Trap draws back the veil of secrecy on the most dramatic event in the life of Elvis Presley. In October of 1975 Elvis was abducted and spirited away to a cabin in the Kentucky mountains where he was made to sing for his supper. After a week in captivity a ransom was paid to ensure his release, a bizarre episode that was hushed up on orders from the White House, no less. 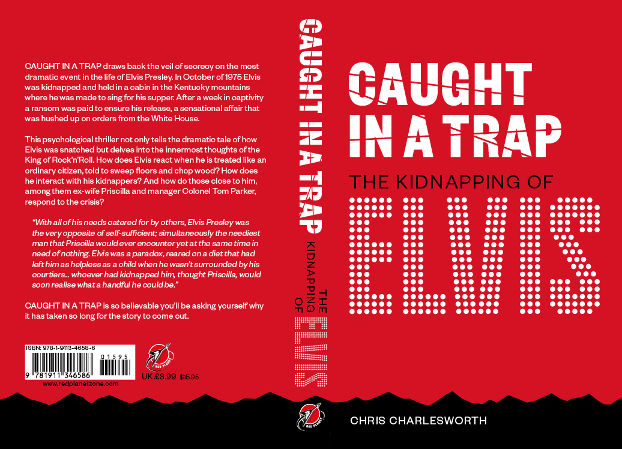 This psychological thriller not only reveals the dramatic details of how Elvis was snatched but also delves into the innermost thoughts of the King of Rock’n’Roll. How does Elvis react when he is treated like an ordinary person, told to sweep floors and chop wood? How does he interact with his kidnappers? Will his songs grant him his freedom? And how do those close him, among them ex-wife Priscilla and manager Colonel Tom Parker, respond to the crisis? Caught In A Trap is so believable you’ll be asking yourself why it has taken so long for the real story to get out. The Stockholm Syndrome has set in. Elvis Presley has bonded with his kidnappers. A ransom note has been delivered to Graceland. At the cabin in the Kentucky Hills where he is held captive, Elvis and his three captors – Delmore Pandel, his wife Sandra and their friend Roy Kruger – have time to kill. It is time for an experiment. Before they slept they checked on Elvis in the locked bedroom. He was sleeping soundly. The following day, after breakfast, all four of them, Elvis, Del, Sandra and Roy, squeezed into the truck and drove into the Daniel Boone National Park, stopping at a gas station on the outskirts of Montecello to buy food for a picnic lunch. Elvis was in a buoyant mood and had to be persuaded to stay in the truck with Roy while Del and Sandra went inside to pick up the provisions, and when they returned he pleaded with them to be able to step outside. Del and Roy looked at one another. “Should we let him?” asked Del. “OK, but you gotta wear this hat,” said Roy, handing Elvis a floppy hat in green camouflage material that he wore while out shooting. Elvis reluctantly placed it on his head. Elvis Presley’s public appearances were almost always pre-planned, tightly choreographed and reported in the press, no matter how brief. On such occasions Elvis made sure he looked the part, dressing up in his capes, buckles and belts, the way he and his fans thought he ought to look. He usually wore outsize sunglasses. Elvis would no sooner slip out of the house in everyday clothes to pick up a quart of milk than the Queen of England would be seen in her nightdress. During pre-production meetings in Los Angeles for the Singer special in May of 1968 its producer Steve Binder had suggested he and Elvis step out of his office on Sunset Boulevard and mingle with passers-by. Elvis was appalled by the suggestion, fearing that he would be mobbed on the street and some sort of disturbance ensue. He was therefore deeply humbled when no one recognised him. “We were just four guys standing in front of this building,” said Bones Howe, Binder’s audio engineer said afterwards. It was quite another thing, however, for Elvis to use the bathroom in a roadside gas station without a security detail checking out the building first, making sure no one else was inside and waiting outside while he relieved himself. However, Elvis had been a captive now for five nights and, although he’d been given a change of clothing – the overalls and t-shirt he loathed so much – he hadn’t had a shave in all that time, nor been able to wash properly and re-dye his hair as was his custom. As a result Elvis’ natural brown colour was just starting to show at the roots and, as each day passed, his stubble had continued to grow but it wasn’t black like the dyed hair on his head, more salt and peppery. The camouflage hat only added to the obvious reality that he no longer resembled anything like the Elvis Presley that the world would recognise. Elvis stepped down from the truck and walked across the forecourt to the bathroom. The only other customer, a young man dressed in a check shirt and similar overalls to those Elvis wore, was filling up a station wagon, and as they approached the bathroom a middle-aged woman pulled up in a sedan, got out and walked towards the shop. Neither gave Elvis and Roy a second glance. Inside the bathroom was another man, splashing water on his face at the basin. He turned and stepped aside as Elvis passed close by him, glancing at Elvis but showing no signs of recognition. When they had finished Elvis and Roy walked back to the truck, passing close to the woman from the sedan who was lingering by a newspaper stand close to the entrance to the shop. She ignored them. Emboldened by the success of their experiment at the gas station, the quartet drove on into the National Park, eventually stopping at a picnic area and eating lunch. Although the area was far from crowded, a handful of other groups of picnickers settled nearby, among them a family of four: father, mother and two boys below the age of 10. After their meal the boys began to throw a football to one another and when one boy failed to catch the ball it rolled to where the group was sat. Elvis glanced at the others. Roy nodded. Elvis picked up the ball, stood up and threw it back to the boy. “Thanks mister,” he shouted from about 10 yards away. The father of the boys waved in acknowledgement and Elvis waved back. He smiled and sat down. The King of Rock’n’Roll was beginning to enjoy normality. In the afternoon the four of them continued their drive through the National Park, stopping now and then and getting out of the truck to admire the scenery. At one particular spot they mingled with a coach party. Elvis again went unrecognised. Driving back to the cabin in the early evening they passed a roadside diner and Elvis suggested they stop to eat. “I can’t remember what it was like to go into a restaurant and be served, just like a normal person, no one making a fuss,” he said. There were only three other vehicles parked outside, and it was safe to assume one of them belonged to the staff. Roy parked the truck and sent Sandra inside to check on how crowded it was. “Me, too,” said Elvis. “But that’s not to say I don’t like your cooking Miss Sandra,” he added hurriedly. Sandra smiled at Elvis, and Elvis grinned back. It seemed like any natural exchange between old friends. “I guess so,” said Roy. “But I still had this with me, just in case.” He opened his jacket to reveal the .38 stuffed into his belt. Sandra thought she detected a touch of hurt in his voice. “I believe you,” she said. Back at the cabin Elvis joined Roy, Del and Sandra on the porch before they turned in for the night. Roy and Del were drinking beer, Elvis and Sandra coke. “Did you guys serve in the army?” Elvis asked them. “Did you let him go?” asked Elvis. Chris is doing various promotion on the book including a spot on Radio London on August 16. From a very early age, there were always Elvis Presley records being played in our house when I was young – singles such as Wooden Heart, Devil in Disguise and Return To Sender in those distinctive red and white RCA label sleeves. In 1963 I went to see the Elvis film Fun In Acapulco at the local Picture Dome cinema -now long since gone. Elvis was the first singing star I was in awe of. Even aged 7 years old , I knew he was very important. Following a brief flirtation with the Dave Clark Five and co in 1963/4, I really got obsessed with music aged 12 in the spring of 1969. At that time, In The Ghetto was riding high in the charts. to be followed by the sensational Suspicious Minds From reading the NME, I knew there had been a revival in his career with the 1968 TV special comeback. I also knew Elvis was back performing live in Las Vegas. I loved all those early 70s singles – Kentucky Rain, Don’t Cry Daddy, The Wonder Of You, I Just Can’t Help Believing, You Were Always On My Mind, Burning Love, and the brilliant I’ve Lost You. It’s my favourite Elvis period. He has such majesty about him and his vocal strength was at it’s peak in my view. One of the best examples of all that, is the concert film Aloha From Hawaii which captures the January 1973 Elvis satellite broadcast performance staged at the Honolulu International Center.. Being a Led Zeppelin fan, I was of course aware of the massive influence Elvis had on Jimmy, Robert, John Paul and Bonzo. Many of the songs Elvis made famous such as That’s’ Alright, Don’t Be Cruel and Mess Of Blues lit up many a rock’roll medley they performed within the live delivery of Whole Lotta Love. 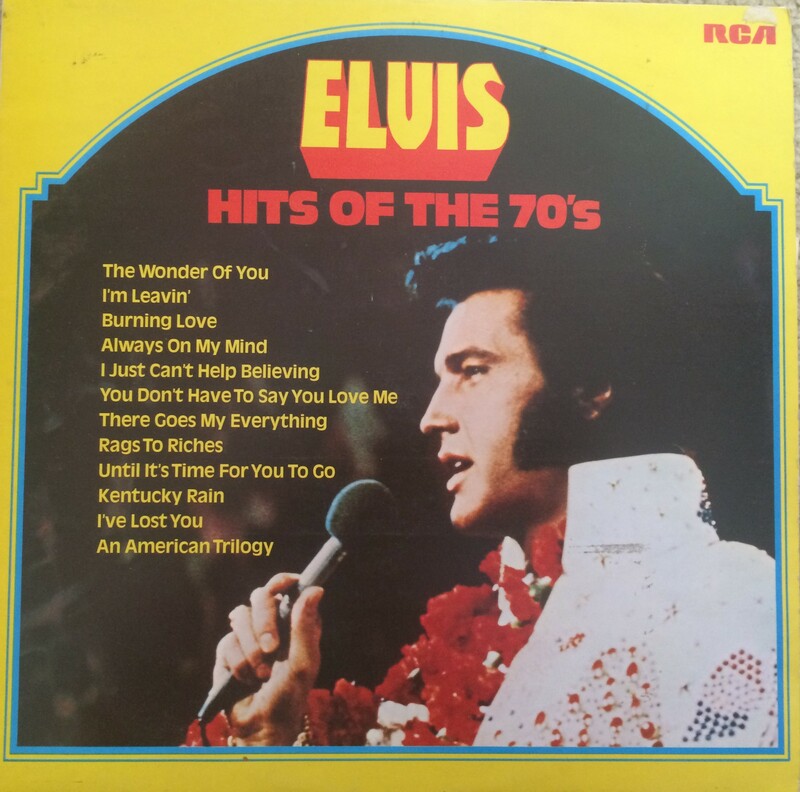 When I started selling records at the WH Smith record department in October 1974, the TV advertised Elvis compilation 40 Greatest Hits was the top selling album in the UK. We sold truck loads of that set – his popularity was still sky high. Again from reading the NME ,I knew by that time his health was suffering with weight problems and prescription drug issues. His on stage performance’s were also very erratic. 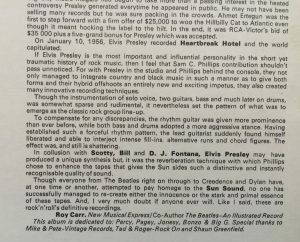 There were still some worthwhile record releases – notable the Elvis In Demand album in 1976. I know exactly where I was when I learned of the shocking news of his passing. I was on holiday from work that week and my then girlfriend Fiona and I were at a party on August 16 and we had stayed over in North London. It was a particularly stormy night and I did not sleep much. When we got the early morning tube back across London, there was the quite unbelievable headline on the newspaper stand that read ”Elvis Presley dead at 42”. Even though he had been in poor health, it was a total shock that he should die so young. The death of Elvis was the first major rock star passing that I experienced – and the worldwide reaction was quite phenomenal. I vividly recall on the night of August 17 just before the epilogue on BBC TV (a nightly ritual back then where they would play the National Anthem at the end of the night’s broadcasts). On this occasion Elvis’s version of Bridge Over Troubled Water was aired in tribute to his passing. I watched it with tears running down my face. Back at work, the next week the demand for anything by Elvis was just incredible. Again such demand was unprecedented. It would be a situation repeated again with the death of John Lennon in 1980. Even though I was just nearly 21, I sensed the death of Elvis indicated the closing of an era. Music was changing, indeed the world was changing. Punk rock had reared it’s head in the UK – the musical climate was facing challenging times. It was also a strange time to be a Led Zeppelin fan. Their 1977 US tour had been curtailed with backstage violence reports and then the devastating news of the death of Robert Plant’s son Karac. The band faced an uncertain future, though Jimmy Page’s interviews conducted in October of that year indicated they would return – and of course for a short period from 1979 into 1980 they did, before the ultimate tragedy of John Bonham’s passing. 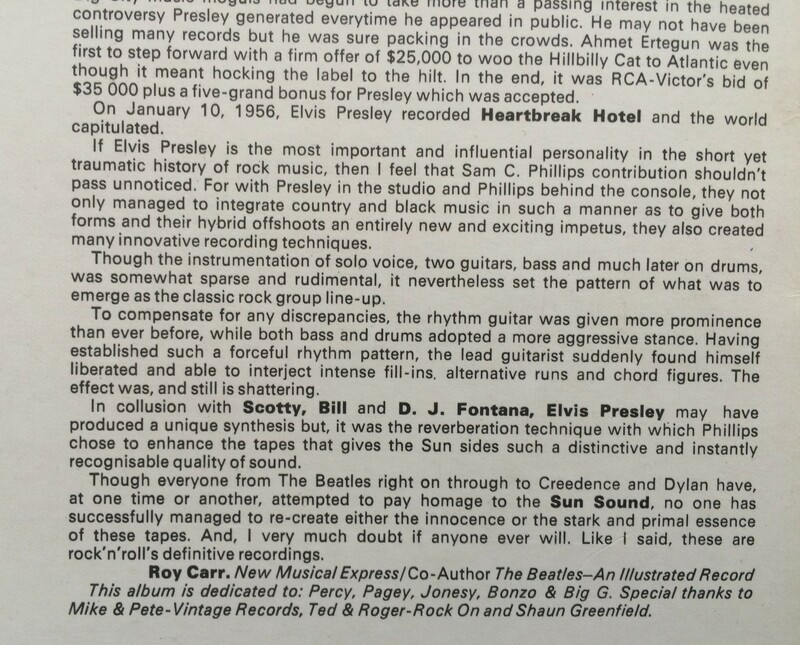 I have a couple of personal Zep/Elvis anecdotes. Thus album is dedicated to Percy, Pagey, Jonesy, Bonzo & The Big G.
I duly purchased the albums and took them back to the Swan Song office in the Kings Road. The albums were then biked to Peter’s home. He was obviously keen to have it in his collection with that affectionate dedication by Roy. Little did I know that a few years hence, I would interview Peter and he himself would be telling me about the time they had an audience with the King and the humorous story of how he had mistakenly sat on Elvis’s Dad Vernon. DL: What was it like meeting Elvis? PG: It was incredible. I’ve still got the badge in the cabinet over there – ‘Elvis in Person On Tour 444’. What happened was we were about 10 or 12 rows from the front. They did a number and it was all over the place and Elvis goes “Stop, stop, stop” and he turns to the audience and says, “We’re gonna do that again because we’ve got Led Zeppelin in the audience and we want to look like we know what we’re doing up here”. I mean what a compliment. And we went back and that’s when I sat on Elvis’ father! There was this huge suite and I was talking to Ronnie the drummer and I sat on Vernon. He was perched on the end of the settee and I just didn’t see him. The promoter Jerry Weintraub told me we’d only get a 20-minute stay and we were up there for two and a half hours. Bonzo and Elvis had been talking about hot rods. When we said goodbye I apologised for sitting on his dad and Elvis looks me in the eye, clicks his fingers and says “Stick around son – you might get a permanent job”. Brilliant. He said how much he’d liked the band. It was then he gave me the badge I noticed one of the minders wearing – Elvis 444 – and I said that was the number of our offices in New York so Elvis promptly tells the minder to give me the badge. Wonderful night. As someone cynically pointed out – dying can be a very good career move. Elvis’s popularity soared after his death. 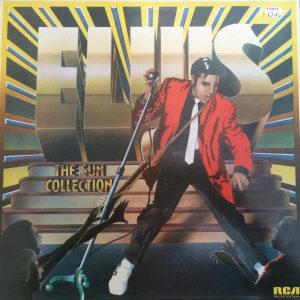 Throughout the next two decades, in my retail years, there were many an Elvis compilation and box set release to inspire sales – and another UK number one single with the remixed A Little Less Conversation in 2002. 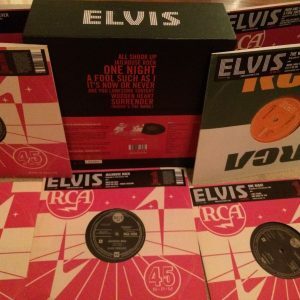 Three years later in January 2005, RCA re issued a special Elvis Singles box set to mark the 70th anniversary of The King’s birth. This was made up of the 18 Elvis UK number one singles. They were issued on a weekly basis as limited edition CD singles and ten inch vinyl singles. At the Virgin megastore where I then worked every Monday morning the day of the release of these Elvis singles we would have a queue outside the door ready to snap them up. At the end of the run, one very kind customer presented me with a bottle of wine for ensuring he was able to complete his collection. There has been talk that the Elvis collectors market is drying up a little due to the fact a lot of collectors are now growing old -time will tell on that. There is a perceptive piece on the current cultural status of Elvis by Stephen Duesner in the September issue of Uncut. I have many an Elvis album, single and CD in my collection and a fair few have been on this past few days to mark this 40th anniversary – including the playing through of those 18 number one singles on the ten inch box set..
DL – August 16, 2017. The changing climate of Santa Eulalia to Bedford had a bit of an effect on me here these past few days as I succumbed to that latent infection known as the common cold. Common it may be but it’s a right energy sapper and I’ve felt a bit wiped out these past few days. With a lot to catch up on following our holiday, the show has gone on on and there has been been work on both TBL 43 and the ongoing Evenings With LZ book project. On the latter project, we are now up to the spring of 1973 so progress is being made. Again co- author Mike Tremaglio’s exhaustive research work is unfolding the story in a uniquely fresh way. here’s a pic taken at Studiomix today as Mick and I waded through the 1973 European tour design and layout. It’s a bit of a birthday season here – Adam’s 22nd birthday was last week and the good lady Janet’s follows at the end of the month. I’ll be stacking up 61 years on September 5. I’m therefore making the September Victoria Record Fair a bit of a post birthday celebration where I am to combine some vinyl purchasers with a pint or two in the nearby Royal Oak pub. The date is Saturday September 9 and I look forward to seeing all that can make it along. Right it’s back to 1973 and those evenings with Led Zeppelin…the 1973 US tour awaits.. 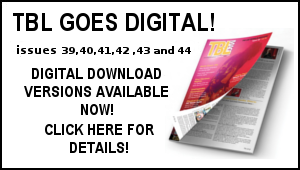 The TBL/DL Facebook page has regular updates and photos – be sure to check it out. Hi Dave, brilliant work as always, thank-you for all you do. 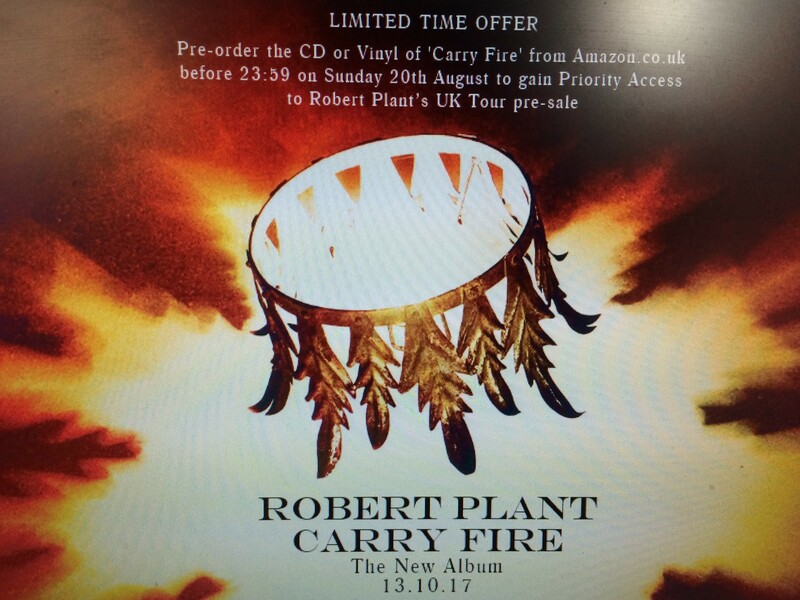 Robert’s new album is duly ordered and I hope to get to RAH. Great playlists, I would say The Way I Feel and All the King’s Horses are a couple of my favourites too. God bless. Robert’s new album ordered and we will be attending the shows in Llandudno and Liverpool. Bring it on. Happy Birthday Mr. Plant! I remember the excitement the first time I saw Pictures At Eleven at the local Mall! I was both scared for you and excited for you and right up until this day I am so proud of you for all that you have done and accomplished and the many risks you have taken. 35 years and counting post Zep. Simply amazing! On another note, I would love to have a CD(s) collection of the many ‘Plantations’ from 1969-1980 of Robert talking to the audience and the band. I love the connection with the audience and the humor and humility displayed nightly – whether its ‘John Paul Jones Heineken’ to ‘That wasn’t Woody Herman folks’. There are so many of them that made each performance as a whole so enjoyable. Eye also Thank Yew Mr. Lewis for all that you do and continue to do for all of us fans. God Bless You! Robert Plant’s solo career has had its standout moments. My personal favorites continue to be: Far Post, Thru with the Two Step, Sixes & Sevens, Walking through Paradise, Greatest Gift, Young Boy Blues, Darkness Darkness and Angel Dance (the last three being superb covers, of course). Great instincts, taste and talent are his hallmarks and always have been.